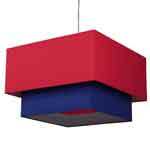 Modern Lampshades . . . . Its what we do ! From our Devon workshop we have been supplying modern and contemporary lampshades to residential and trade customers for over 50 years. 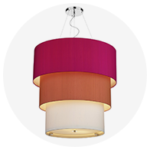 Our online modern lamp shade range consists of a wide selection of our own handmade modern lampshades as well as ranges taken from other UK and European partner lamp shade suppliers. 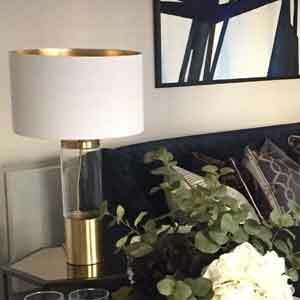 In addition to stocked modern lamp shades we also produce custom made designs to almost any shape, style and size, gaining the reputation as the UK's most comprehensive modern lamp shade supplier. 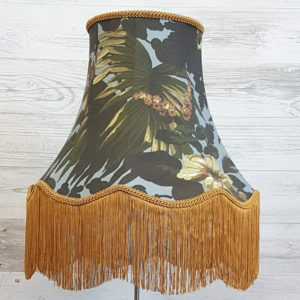 We manufacture bespoke modern lampshades to any shape, style and size, with over 300 stocked fabrics to choose from and the ability to digitally print designs or use customers own fabric. 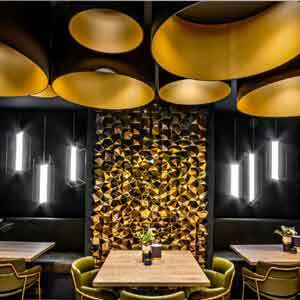 Popular modern lamp shades styles include extra large drum shades, squares and rectangles, examples of recent modern lamp shade projects can be found below. Our bespoke modern lamp shade service is particularly useful if you have a lamp with an unusual or unique fitting, we have the ability to custom make the internal fittings of most modern lampshades and specialise in modern lamp shade modifications. Changing the lamp shade of an existing modern table lamp is a quick and cost effective way of injecting a new colour into your colour scheme. 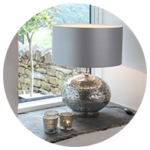 Our modern table lampshades are available in all shapes and sizes either from stock or handmade to your exact dimensions. 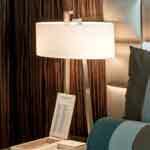 Refresh that table lamp with one of our stunning modern table lampshades. Modern candle shades and wall shades seem to be the most replaced style of modern lampshades, if its not damaged from a stray child's toy you can bet your life its been scorched by the light bulb! We have a comprehensive range of modern candle shades that clip directly to the bulb, our modern clip on lamp shades come in an array of shapes and sizes or can be custom made in your own fabric and trim. Not only functional and necessary; modern lampshades can also dramatically enhance a space aesthetically. 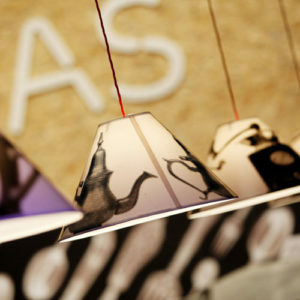 When thinking of adding modern lamp shades to your home, try not to limit yourself to just a modern pendant lamp shade. 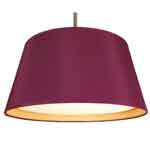 Instead, incorporate a blend of modern pendant, floor, wall and table modern lampshades into your home. By introducing these modern lampshade options you can create dramatically different moods and they can look just as good switched off as on. 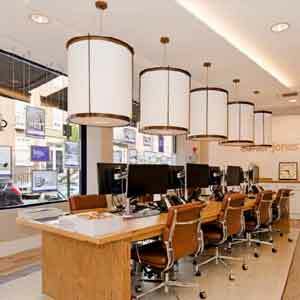 It is very easy to get overwhelmed by the different types of modern lamp shades available to buy, as well as wattages, lamp colour, range and efficiency. There is certainly more to it than meets the eye and at Imperial Lighting we have the knowledge and experience to assist you with making the perfect modern lampshade choice for your home. Imperial Lighting expertly source modern lampshades in order to provide you with a vast array of unique and stylish shades to add to your interior, whether it is private or commercial. Alternatively, we are able to offer you modern lampshades that come in a huge variety of shapes and sizes to enhance any interior. Our modern lampshades can be hand-made to order in over 300 stocked fabrics ranging from cottons to silk Dupion; alternatively you can request a modern lamp shade to be made in your own fabric. 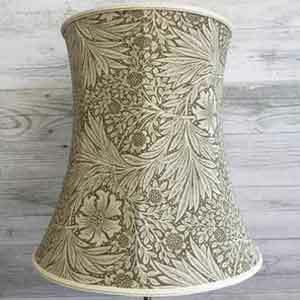 We also have the ability to digitally print onto the inside or outside of your modern lampshade, to create a unique feature shade. Imperial Lighting is the first choice for many Interior Designers, Architects and trades-people for modern lamp shades in areas such as the hospitality industry, cruise ships, shop fitters, restaurants, pubs and contract furnishers; supplying or manufacturing modern lampshades that are of the top quality you would expect from the country’s leading lamp shade specialist. 265 ginormous modern triangular lamp shades fitting with RGB colour changing LEDs create a contemporary feel in this super modern building. Modern 2 and 3 tier drum lampshades in tweed with modern contrast linings supplied to numerous branch re-fits. 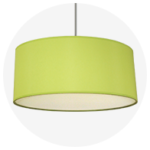 The main focal point in most rooms will be the central pendant lamp shade, whether it is a simple modern drum lampshade, an extra-large shade or a flush shade. A modern lampshade can completely transform a room and is probably the easiest way to achieve a dramatic modern lighting effect. 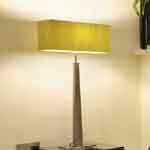 Imperial Lighting offers a Lamp Shade Builder service where you can easily create your own modern lampshade on-line which will then be hand-made to order. This easy step by step process involves choosing a shape and colour from our wide range of modern lampshade shapes and colour choices.